Brush both sides of baguette slices with olive oil and arrange on baking tray. Sprinkle with salt and pepper. Bake for 10 minutes. In a medium saucepan, place tomatillos with enough water to cover them. Boil for 7 minutes. Remove from water, let cool and chop in 1/4-inch pieces. Place 2 tablespoons shredded cheese on top of the crostini, top them with 1 tablespoon tomatillos and return to the oven for 10 minutes until the bread is golden brown. Remove from oven and top each baked crostini with a strip of poblano pepper. Add salt and pepper to taste. Tomatillos can be roasted or made in a salsa. Top with jalapeño slices for a spicy kick. 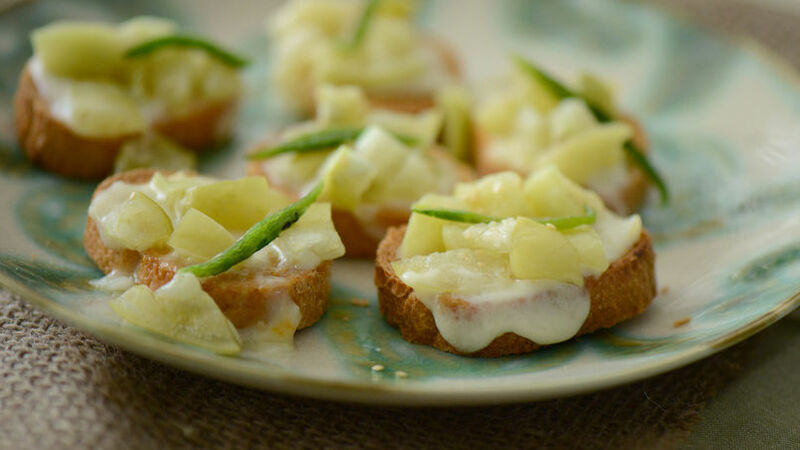 Crostini are easy appetizers that can be prepared in a short period of time and topped with your favorite ingredients, whether sweet or savory. I had a few tomatillos leftover from making green enchiladas so I decided to treat my weekend guests with these little savory crostini everyone went crazy for. Since cheese and tart tomatillo pair perfectly well, the toasted bread give it that ideal crunch with a spicy kick of poblano pepper.